Valencia College was acknowledged as one of the top educational institutions in the nation after wining the inaugural Aspen Award for Community College Excellence. Along with the award comes a grant of $600,000 that Valencia can spend to expand on its future goals in education. Valencia was given this honor because of striving to improve what really matters in a community college. Valencia’s degree awards rates are one of the best nationally for a community college. Graduates get employed at a higher rate then any other Aspen finalist and the school boasts the highest number of four year college transfer students in the nation. “If it can be done at a community college setting, they’re doing at Valencia, and they’re doing it very very well,” said former Michigan Governor, John Engler. Engler and former South Carolina Senator, Richard Riley, presented the award to Valencia’s President, Sandy Shugart during the Monday morning ceremony at Washington, DC. Millions of students have shared in this unique opportunity since the founding of Valencia in Orlando, Florida in 1967. Valencia ranked number one last year for awarding the most Associate degrees in the nation for a two-year institution. There is a current annual enrollment of over 70,000 students and an operating annual budget over $160 million. Global educational trends show that the U.S has falling to twelfth place for young adults with Associate degrees, and nationally there is an increase of students dropping out of high school or considered unprepared to attend college after graduation. Despite this fact, Valencia projects to expanded on its number of graduates through programs committed to equitable outcomes and success plans for lower income and minority students. Community colleges furthering the skills of American workers is a strong focal point for fixing the woes of the recent economic recession. With so many people today out of work or underemployed, continued educational programs like the one offered at Valencia are encouraged and supported by many in government. Currently around 60% of available jobs require advanced degrees, while only 40% of adult American workers have those degrees. If Americans don’t step up to fill theses jobs they will migrate overseas and continue the general economic downturn in the near future. 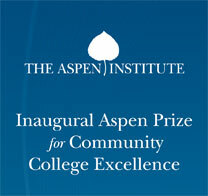 The Aspen Institute hopes to continue awarding future institutions by furthering this into a yearly prize. Founded in 1950 this organization's goals are "fostering enlightened leadership, the appreciation of timeless ideas and values, and open-minded dialogue on contemporary issues."